I take no joy in being the bearer of bad news. That might sound strange coming from the author of The Harbinger and The Mystery of the Shemitah. But that’s the point. If I must be that bearer, then there has to be a very strong reason behind it. And so when I’m asked to write how America can avoid judgment or calamity, I find myself in a predicament. The reason is this: I don’t believe it will be avoided. And if we don’t look at the magnitude of the situation, we’ll be of no effect, impact or good in the matter. What we are now witnessing is unprecedented in the history of America and modern culture. In the 1970s Ruth Graham made the statement: “If God doesn’t judge America, He’ll have to apologize to Sodom and Gomorrah.” Those words were spoken at a time when the Ten Commandments were still displayed in public schools and government buildings, when marriage was overwhelmingly upheld, when the idea that God and Jesus could be mocked on national television as the object of comedy would be unimaginable, when the idea that there would come a time when half or more of American children would be born out of wedlock and the president of the United States would be endorsing homosexuality would be unimaginable. And yet if Ruth Graham could speak of God’s judgment on the America of that day, how much more true is it now, and how much farther is this nation down the road to judgment? While individual believers, churches and ministries may see success in ministry and many brought to salvation, the state of the church as a whole with regard to the culture that surrounds it is another matter altogether. Despite what many preach, these are not the best of times and things are not getting better—but decidedly worse. There has been no great national revival on American shores in years. But there has been a great apostasy. And that apostasy has deepened in its intensity, widened in its scope and accelerated in its speed. And most of the church has been ineffective in slowing it down, much less stopping or reversing it. We now find ourselves on the defense, having our jobs threatened for merely standing on the Word of God. And rather than causing us to grow stronger, too many believers and ministers have grown timid and weak, not wanting to pay a price for their faith. And in the midst of the greatest moral and spiritual decay in modern times, the pulpits have largely grown silent in answering it, more focused on how God can fulfill our will and desires than calling the church to fulfill the will and desires of God. And we wonder why the culture around us is going to hell. If the American church had been the salt and light it was called to be, there is no way that the culture could have grown so dark and rotting. So do I believe that we can avoid God’s judgment, the hand of His shaking? No—not any more than could ancient Israel. No nation, so blessed with God’s blessings, can so blatantly war against the God of its blessings and expect those blessings to continue. I believe a great shaking is coming to this nation. Does that mean I have no hope? No, not at all. Rather I believe that America has grown so far from God that without a great shaking there would be no hope. I believe America has grown so deafened to God’s voice, that it will not be in His whispers but in His crying out and shouting that it has any chance of now hearing. Most of us came to the Lord, or drew closer to the Lord because there was some kind of shaking in our lives. If that’s true for individuals, why do we think it less true for nations? In the days after 9/11, it looked as if there was going to be a national revival. And there was a window of time when it could have taken place. All across the nation, people flocked to churches and prayed for God’s blessing. But there was no revival because there was no repentance. And without repentance, there can be no revival. And so it was not only that America failed to return to God, but in the years following 9/11, grew much farther away from God than it had ever been before. I believe it will take an event even greater than 9/11 for America to wake up and return. I don’t believe that it’s a choice between judgment or revival. At this point in America’s descent from God, I believe it will only be through judgment, as in a great shaking, that revival would come—to those who will hear and turn. Do we have a role to play in this? Yes. Do we have any biblical model to give us direction? We do. The prophet Elijah likewise lived in a time of national apostasy and judgment. And yet he was powerfully used to accomplish God’s purposes. What does he reveal to us about our calling in this day? Even in the face of great evil and persecution, Elijah never succumbed to the temptation to live on the defensive. He lived decidedly on the offensive. He knew that no matter what it looked like, God was in control and so as long as he followed God, he would be living on the winning side. Elijah lived, not to be acted upon, but to act upon the world around him. In the same way we must resist the temptation, in a day of great evil, to become reactionary and to live on the defense. The Lord didn’t give us that option. We are of the kingdom that only advances. We must therefore live proactively, resolving that we will not be affected by the world, but the world will be affected by us. We must set our hearts, make it our goal, to impact the darkness around us with the light. Elijah was engaged with the nation and culture surrounding him. He was a light shining in its darkness. We must be the same. No matter what age we live in and no matter what the state of its culture, our calling to be the light of the world remains. The light doesn’t ignore the darkness. The light doesn’t pretend that the darkness isn’t really that dark. It doesn’t tone down its light to be politically correct or not to offend. It doesn’t hide its radiance in fear of persecution. Nor is it content to live a self-absorbed existence focusing on itself and its own prosperity. If it does any of these things, then it ceases being the light. What does the light do? It shines. It lights up the darkness. It changes the world around it. If we want to see revival, we must do likewise. Elijah lived in the midst of famine, and yet was unaffected by it. He had weaned himself of dependence on his culture and world. At the same time he became more and more dependent on God. The two things go together. Likewise, in the days ahead, we must become more and more independent of the world and culture around us. We must wean ourselves, our spiritual life, our emotional life, our thought life, our identity from the world. How do we do that? By becoming more dependent on God. The more plugged into God we become, the more independent of the world we will be. We must root and ground our lives all the more deeply and strongly on God and His Word. That which can be shaken will be shaken. But that which is rooted and grounded in God’s Word and truth will not be shaken. In the same way, Elijah was a man of prayer. And the Bible records that his prayers were heard and effective. In the days ahead, we must become, even more so, people of prayer. In days of apostasy and chaos, it will be our sustenance and our strength, an anchor in the storm. Elijah was a man of righteousness. The Bible reveals that his righteousness was a key part of his ability to impact what happened to his nation. If we want to impact the future of our nation, we must likewise live lives of integrity and walk in righteousness. One of the most central Scriptures of revival, 2 Chronicles 7:14, involves as a key component that the people of God “turn from their evil ways.” If we walk in darkness, how can we be a light to that darkness? If we walk in the ways of the world, how can impact it? And if we’re afraid of being different, how can we make a difference? It is crucial that we do whatever we have to do to live lives consistent with our faith, and walk in righteousness. Elijah knew nothing of a self-centered faith, focused on increasing his blessings and prosperity. Had he been focused on such things, he would have become of no effect. We must reverse the momentum. Instead of living to be blessed, we must live to be a blessing. That’s how Paul lived. That’s how Messiah lived. And that’s the vessel that God will use to impact the world. Elijah never softened the Word of God and never compromised. In the same way, we must reject a watered-down gospel. If we want to see the full power of God’s Word, we must take that Word at full strength. We can’t compromise to win people. Rather it is when we don’t compromise that we burn with the passion of God and shine with His glory—that’s when revival comes. Elijah didn’t just preach the calling of God—He lived it. So we too must not only preach revival and pray for revival—we must start living in revival now. We can’t force others to walk in revival, but we can choose it for ourselves. If there is anything in our lives which has no place in the life of a saint, and which is under judgment, the time is now, not later, not tomorrow, to get it out of our lives. And if God has been calling us to answer His call, and we have not yet done it, the time is now, not later, and not tomorrow to answer it. Revival begins with us—or it doesn’t begin at all. We must not pray that God will spare America hard times, but rather that God will do whatever it takes to bring about repentance, salvation, and revival. The ministry of Elijah wasn’t hindered by calamity or persecution—rather it thrived. So the days in which we enter will not hinder our calling. In fact, these are the days that cause those who hold true to God’s Word to become great. When the dark grows darker, the lights grow brighter. Choose to do the right thing, even when it’s hard, even when it costs. Choose to be great and you will be—in His power. The eyes of the Lord search to and fro throughout the entire earth seeking the one whose heart is completely His. You be that person. And let us be that people. And God will greatly use us to accomplish His will on the earth for such a time as this. 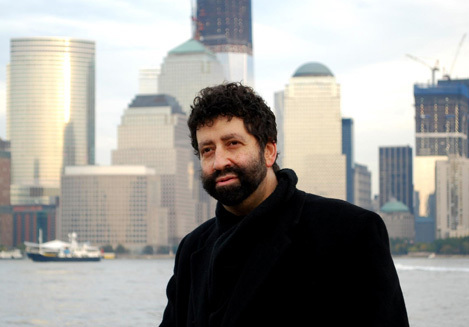 Rabbi Jonathan Cahn is the New York Times best-selling author of The Harbingerand The Mystery of the Shemitah, president of Hope of the World ministries and senior pastor and Messianic rabbi of the Jerusalem Center/Beth Israel in Wayne, New Jersey. His teachings are widely known for revealing the deep mysteries of God’s Word. Rabbi Jonathan Cahn shows how America is fulfilling Isaiah 9:10 by refusing to repent in the face of calamity at jonathancahn.charismamag.com.